Mushrooms are often called "the fruit of the fungi world." Shitake and Enokitake mushrooms are two of the varieties that known to contain "umami" or the fifth taste group, which is the pleasant, savory taste and is found naturally in many foods. Mushrooms are low in calories, fat and cholesterol-free and low in sodium. Mushrooms are the only fruit or vegetable with vitamin D. The top three selling mushroom varieties (button, crimini and portabella) have vitamin D ranging from 1 to 97 percent of the Daily Value (400 IU) per raw 84 gram serving. Scientists are currently exploring links between low vitamin D status and increased risk for a number of chronic diseases, including heart disease, type 1 diabetes, and multiple sclerosis. 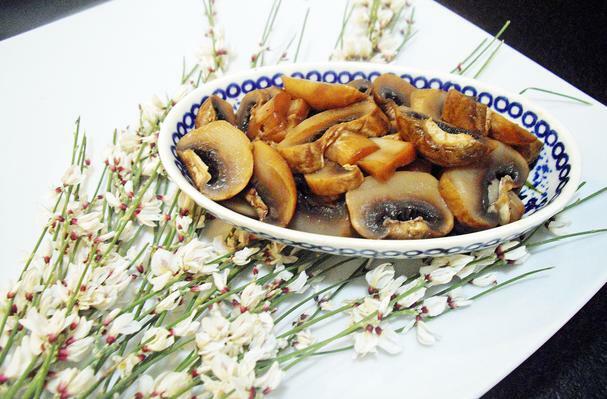 Mushrooms are high in anti-oxidents and help to strengthen the immune system. They contain B vitamins, including riboflavin, niacin, and pantothenic acid, which help to provide energy by breaking down proteins, fats and carbohydrates. B vitamins play an important role in the nervous system. While it's tempting to forage your own mushrooms in the woods and fields, there are many varieties of non-edible and poisonous mushrooms and it's best to purchase them directly from a supplier that is knowledgeable about what they are selling you. Many poisonous varieties resemble the non-poisonous varieties. Mushrooms are generally characterized as having a stem, a cap and gills. They come in a myriad of sizes, colors and shapes. They are fleshy, spore-bearing fruiting body of a fungus, typically produced above ground on soil or on its food source. Choosing: For common mushrooms, choose those with a firm texture and even color with tightly-closed caps. If the gills are showing, it's an indication of age, and they are probably past their prime. Discolored, broken and damaged mushrooms with soft spots should be avoided. If you are cooking mushrooms whole, choose those that are uniform in size to promote even cooking. Look for young mushrooms, which are closed as opposed to open and flat. Purchase only the amount of mushrooms that you intend to use before the expiration date. Buy mushrooms displaying the latest expiration date on the package. Buying: You can buy mushrooms at your nearest grocery store. Procuring: Be sure that you either are fairly knowledgeable about harvesting wild mushrooms. There are many species that can be poisonous, even deadly. There are many varieties commonly used in cuisine, both cultivated and wild ones. Mushrooms typically used in cooking include: white (Paris) mushrooms, shiitake, portobello, truffle, chanterelles, morels and a variety of wild mushrooms. Cleaning: Mushrooms are extremely porous and soak up water like a sponge. Because they are mostly water, never soak fresh mushrooms. Since commercially-available mushrooms are grown in a sterile medium, invest in a soft mushroom brush and simply brush away any clinging growing medium rather than washing with water. If you must, wipe them with a damp paper towel. Be aware that salt releases the water in mushrooms, so judge the salt usage accordingly for your particular recipe. There is no need to peel mushrooms. In fact, peeling mushrooms nullifies most of their flavor. Simply trim off any damaged spots and tough or dirty stems. Use a mushroom brush to clean the mushrooms. They can be sliced or served whole. There are over 38,000 varieties of mushrooms available, over 3,000 in North America alone, with varying colors, textures and flavors. Some are so rare that they only grow for one week during the year. They grow wild in many areas, but most mushrooms on the market are commercially-grown on farms. Mushrooms do not depend upon photosynthesis to grow. They need only rain and moderate temperatures to proliferate. The best mushroom harvesting is done while it is raining. Some areas are known for their prized wild mushrooms, but it is most important that you research your target thoroughly if you intend to harvest your own wild mushrooms because many are highly toxic and life-threatening. Please do not rely upon any casual column to determine toxicity of wild mushrooms. The danger inherent in many poisonous varieties of mushrooms cannot be over-stressed. Unless you are well-educated in all types of mushrooms, particularly in identification of poisonous ones, it is wise to purchase your mushrooms from a reputable grower or grocer rather than hunting them yourself. A simple identification error can lead to symptoms of sweating, cramps, diarrhea, confusion, convulsions, and potentially result in liver damage with a mortality rate of 60 percent or higher. History: In the eighteenth century, France began cultivating mushrooms resembling the basic mushroom that we all buy at the market. Prior to 1940, the most widely available mushroom was the Italian brown, now known as the crimini mushroom. From this early lust for fungi arose the taste for more exotic mushrooms, including shiitake, enoki, oyster, morels, cepes, chanterelles, and more. The Egyptians believed that mushrooms were an essential "ingredient'' to immortality and the pharaohs decreed them forbidden to the common folks. Other cultures have used them in medicinal and rituals practices.